Blues Lovers United of San Diego » 2019 BLUSD BLUES SUMMER CAMP ANNOUNCED! 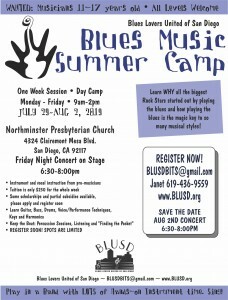 Blog > BITS > 2019 BLUSD BLUES SUMMER CAMP ANNOUNCED! 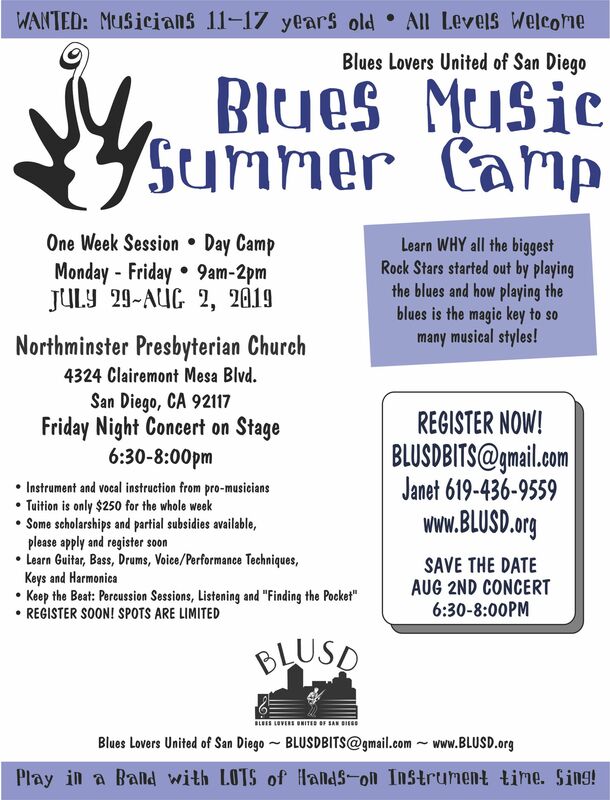 BLUSD is proud to announce our Blues Summer Camp for kids ages 11-17, taking place 7/29-8/2 at Northminster Church in Clairemont. Campers receive instruction on their instrument of choice, and perform in concert on Friday night. It is the best thing EVER! Enroll your kids now, as spots are limited! Contact our Blues in the Schools Coordinator Janet Blair at moc.liamgnull@stibdsulb, or 619-436-9559. See you there!